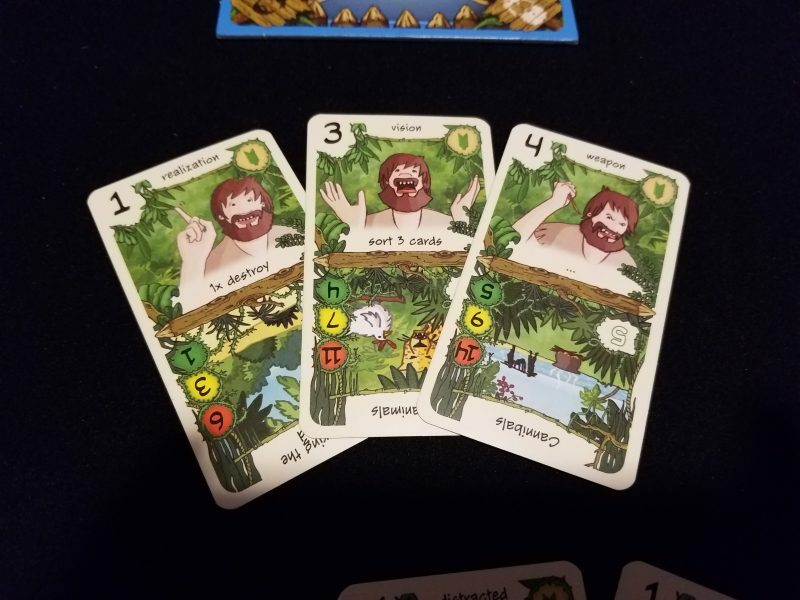 Friday Review I'm On An Island! I just realized the main irony of Friday. It would be a great game to have with you if you were stuck on a desert island. It’s portable, a solo game, challenging, and replayable. Plus it’s about being stuck on an island. Of course, it’s also very green, because it’s designed by Friedemann Friese, a man obsessed with the color green. But that works here because in Friday you’re stuck on a tropical island with many threats lurking about. You begin as a dim-witted idiot, but through cunning and strategic failure you could end the game beating a pair of pirate ships single-handedly. Yes, I said strategic failure, which is a large portion of what this game is about. Like with any deckbuilder you start with a hand of cards that are more or less useless, and throughout the game you improve on that deck. You do this by facing hazards. Each hazard indicates how many cards you flip over to face it, and what power threshold is required to overcome it. If you can’t beat the power threshold, you have to pay one life for each power you’re lacking. More significantly, you can then trash cards you just played. For instance, say it’s the beginning of the game and I flip over the top two threats from the deck. I choose one that flips over two cards and needs 1 power to overcome and discard the other. From my own deck I first flip over a card showing Friday looking like a dazed idiot (close to his normal expression). It says “distracted” and gives me -1 power. The next card is a “normal” one and has no power at all. Wonderful. No, really, this is perfect. I’ve failed the check by two, so now I can spend two life to get rid of those two cards. They’re awful and I don’t want them. Top to bottom: hazard cards, starting cards, ageing cards. But there’s a limit. You only start with 20 life points, and they go away quickly. That’s not the only limitation on the wild card-trashing fest that consumes the first part of this game, however. Perhaps more significantly is the ageing deck, which is entirely comprised of very harmful cards. One of these is added to your personal deck every time you need to reshuffle it. So after you’ve honed out all of the garbage cards the first time through, you’re suddenly going to find yourself adding even worse cards in at a quick rate. It’s a beautiful point of tension, sort of like a rubber band tightening around your priorities. Enhancing that feeling of tension is the fact that you can always spend one life counter to draw an additional card for the deck, which creates some beautiful press-your-luck situations. The rubber band has to snap back, and in Friday this usually happens somewhere in the second of the three main rounds (i.e. times through the hazard deck). You’ve gotten rid of most of your starting cards, you’ve managed to keep the ageing cards at bay, but you’re nearly out of life and you need to start winning, quickly. Fortunately, every single hazard you defeat becomes a new card into your deck, and the latter half of the game is a race to try to get all of the best ones you can. Unfortunately, the difficulty of each hazard card increases significantly each round, so actually winning the encounters can be tough. Once you start incorporating these cards into your deck, the game becomes a bit more complicated. Most of the cards will have not only a power level, but an ability as well. It can be as simple as getting a couple of life points back, or drawing two cards, or it can let you peek ahead at the next three cards in the deck, destroy a card that’s been played, or place a card at the bottom of the draw pile. Friese wisely lets you activate abilities whenever you want, so there are some interesting puzzly decisions of when and how to activate abilities during the standard draw process. Manipulating those cards to the best of your ability takes up the latter half of the game, and it’s a really clever system. I love the narrative arc of it, as you start out helpless, lose battles early, but through that experience grow into a more powerful fighter. It provides thematic cohesion to this pretty typical deckbuilder arc. And for a solo game, I think I like the familiarity of it; each game is going to have the same basic flow, but the details are going to be different. The details on the cards and in which order they arrive vary enough to not become stale. Maybe if you were playing this every day it might become tiresome after a while, but it’s enough for me to keep enjoying it. 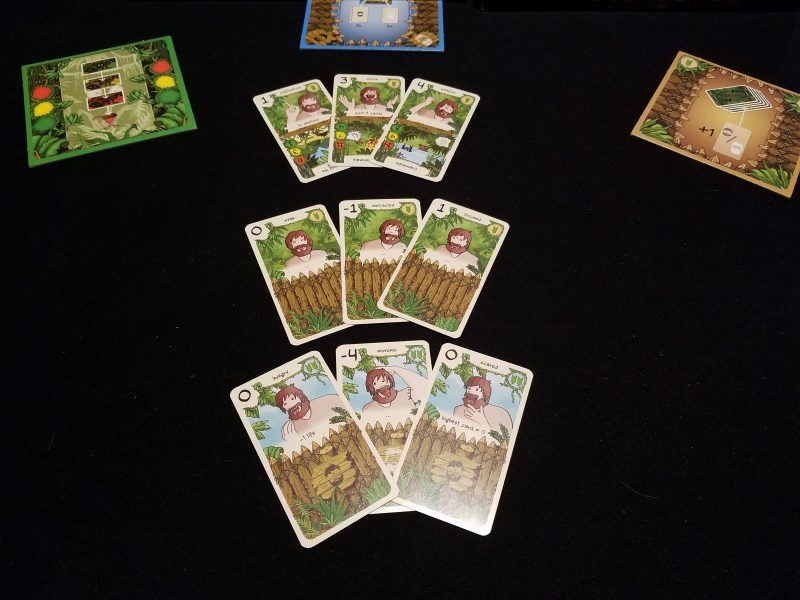 Friday is also deliciously challenging, with the “level 1” difficulty offering a fair challenge for new players, and the three subsequent levels providing even more challenge once you get the hang of it. I’ve played maybe 30 times and I’ve beaten level 3 twice out of the 10 or so attempts. I’ve never tried level 4, but I know eventually I’ll become astute enough to try to take it on. The most accurate compliment I think I can give to Friday is that it is very competently designed. Nothing feels out of place, unnecessary, or over/under powered. Each design decision is purposeful and sensible, and nothing here will throw you for a loop or make you scratch your head. 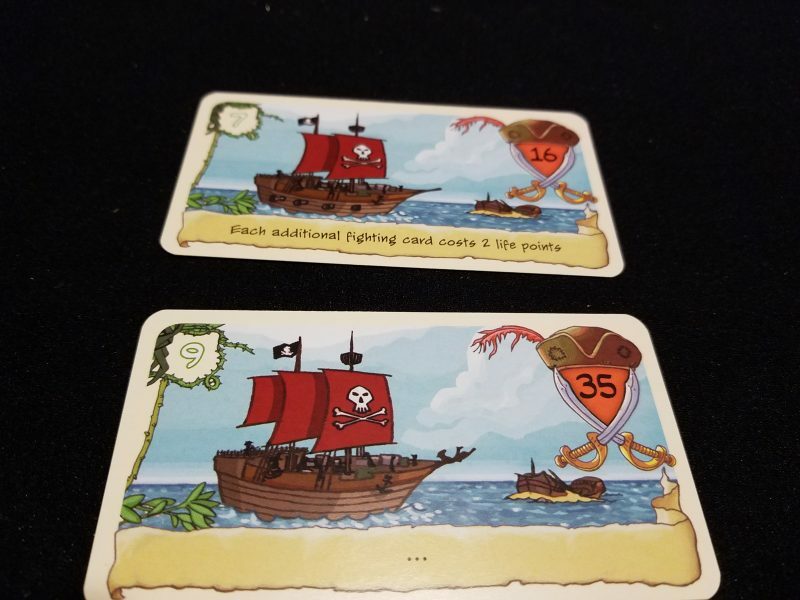 The finale, if you survive that far, is against two pirate ships that will usually let you explore most, if not all of your deck in an attempt to beat them. It’s a great conclusion that lets you see first hand how potent and streamlined your deck has become. Every once in awhile Friday does get a bit frustrating. If you get some bad draws early it can snowball quite a bit, which is annoying. When this happens I just start over and try again. In the latter parts of the game when you’re fighting big enemies, your play area can become cluttered with cards, and it can be difficult to remember which abilities you use and how many attack points you currently have, even if you’re diligently tapping cards once you’ve used them. Those are minor quibbles in an otherwise enjoyable game. It’s not going to provide a dramatic, exciting experience, but it is going to be a fun game every time you sit down to play. It doesn’t keep me awake at night with its puzzles, but it does engage my mind when I’m playing. I sort of wish it wasn’t just a solo game, so I could play and strategize with others, but it does what it sets out to do well. Good enough for a desert island? Absolutely.